A transform fault is where parts of the Earth’s crust slide horizontally past each other. 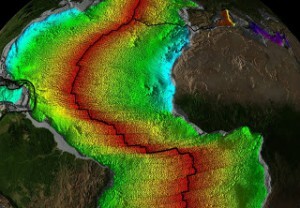 Most transform faults connect offsets to the 65,000 kilometer seam that runs through every ocean. About two thirds of the earth’s crust formed from the basaltic seafloor that oozes out of this long tectonic seam. This is a map from NOAA showing the mid Atlantic seam as a jagged black line. The transform faults are lighter black lines that are perpendicular to the main seam. The map was drawn by Elliot Lim and Jesse Varner using data from the National Geophysical Data Center. Data source: R.D. Muller, M. Sdrolias, C. Gaina and W.R. Roest. The colors represent the relative ages of the sea floor. The youngest seafloor is red, the next yellow, then green, light blue,deep blue and finally violet. The oldest ocean on Earth is the eastern Mediterranean (the violet on the map), which at one point was the only surface sea on our planet. How can we be sure which ocean formed first? Oceanic basalt contains tiny microscopic crystals that solidified when the sea quenched the undersea lava. Some of the elements trapped in the crystal lattices are radioactive. By measuring the ratio of the decay products to the radioactive parents, scientists can tell which seafloor is older, relative to one that has less decay products. 1. At one point the Atlantic was a thin strip of water separating the eastern coast of North America and north-western Africa. This ancient sea was split down the middle by a volcanic expansion seam, the Mid Atlantic ridge. The ridge is a mountain chain split by a steep valley in which molten basalt continues to form new seafloor. Most earthquakes occur in the vicinity of this active seam showing that this is the most active geological place on our planet. 2. The mid ocean seam is offset by long perpendicular transform faults. These serve as offsets, showing that the seafloor has grown as well as the diameter of the Earth also increased. The ridge system is global, containing several triple junctions. Triple junctions are where three tectonic plates meet. The Azores-Gibraltar ridge begins at a triple junction in the Mid Atlantic. It then runs through Gibraltar where an underwater cliff exists. Evidently the drowned waterfall once allowed the Mediterranean to refill from the Atlantic. The volcanic crack runs through the Red Sea into the Indian Ocean where it connects to other triple junctions that eventually encircle the whole globe. 3. In the Atlantic, just north of the equator lies a long transform fault, the Romanche Fracture Zone. The Romanche fault has young material on one side and older on the other. This indicates that the Earth crust has shifted laterally along this transform fault. The Romanche gap allows a deep current to flow from the western Atlantic to the eastern Atlantic. 4. Long transform faults point toward the coasts that used to be joined and are parallel to the motion of the crust. They also bend slightly showing that the Americas have rotated clockwise from their former positions against Europe and Africa. Donald F. Argus shows that the transform faults are rotated more from the East-West direction as they near the equator and progressively less in northern latitudes. Perhaps this rotation is because there are more oceans in the southern hemisphere. As the modern oceans formed, the continents were separated by the growing oceans. Argus also shows that the plates today are spreading faster near the equator than at higher latitudes. 5. Thousands of shorter cracks split off from the main transform faults. These short faults are at oblique angles to crustal motion. Add cold water to a half a cup of flour and mix into a thick cream. Simmer in a saucepan, stirring until you get a thick paste. Cool and smear it thickly onto a partially filled balloon. After the flour past has dried, add more air to the balloon. As you blow up the balloon, you will see global cracks and transform faults. Transform faults in the ocean are evidence that the interior of the earth has expanded like a balloon. This is not the only evidence. The continents only fit together on a tiny globe, without major seas. The alleged subduction trenches contain undisturbed, layered sediments. How could dense basalt (covered with wet clays) dive into the molten interior of the earth without leaving scraped off ocean oozes or forming scarps and volcanic vents? The planet has apparently grown internally, splitting its crust like an overripe banana slits its peeling. The gif of the growing earth is from Michael Netzer who allows its publication with attribution. What we see is evidence for biblical earth-history. Three times the Bible states that the earth spreads out in unbroken continuity. It even explains where this continuous action occurs, above the waters (Psalm 136:6). Isaiah 42:5 tells us that God continues, in unbroken continuity, to spread out the Earth and what is born (emerges) from the Earth. Zechariah 12:1 says God continues in unbroken continuity to lay the foundations of the Earth. Someone might argue that the ocean floors formed millions of years ago. The biblical genealogies only give an earth-age of about 6,000 years. You should always interpret the Bible hermeneutically, not tailor it to fit scientific ideas about time. No one during the Old Testament age could imagine time as some separate medium nor did they have a linear view of history. The ancient world view was about the degeneration of all things, including the duration of days and years (Genesis 47:9). Gravity aberration accelerates days and years together even as all matter keeps on changing relationally. Read about gravity aberration and evidence for a growing Earth on this web site.